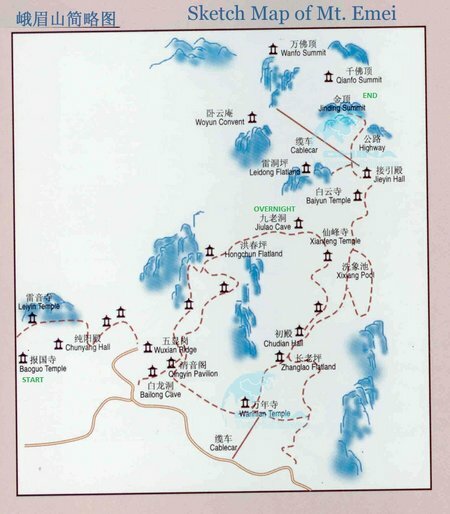 This is a trail map for Mt Emei (Emei Shan) in Western Sichuan. I say “a” trail map because it is one of three that I’ve seen – all of which are different. The hike from START to END (as marked on the map above) might have been 45km or it could have been as much as 60km since both maps and guidebook descriptions differed in distance measurements. The maps were at least consistent in the 3,000m elevation gain. I didn’t find this map until after we’d finished the hike which is unfortunate because it represents the inclines and declines on the trail more accurately than either of the maps we had with us – then again, it’s possibly a good thing that we didn’t have this map because if we’d known just how grueling the trail was, we might not have attempted it. Would that every trail we’ve ever hiked have such an impressive trail start! This little pagoda made us realize that this was going to be a very different kind of hike, one where we’d be passing temples all the way up the mountain and even, if everything went as planned, staying overnight at a temple on our way. It was really, really good to get out into the fresh air after having spent almost a month mostly in large cities as we’d traveled up through Eastern China from Hong Kong. The air itself was so fresh and clean. I started to recognize familiar smells of pine and juniper and the mountain soundscape was alive with birds and insects. Not that we heard the birds much at first. The Murphy/Duffy family was collectively in a pissy mood. If bickering was an Olympic sport, we’d have easily won medals that day. It took a blowout (one person striding off, one sitting on the trail crying, two yelling at each other) to clear the air but thankfully by the time we reached the third temple, we were all happy families again. At this stage, about two hours into the hike, I was starting to get a little worried about the pace of our progress. It seemed that we hadn’t done much uphill compared to what we needed to get done by the end of the day. We pressed on, up and down the concrete steps on pretty flat terrain. And then we turned a corner and walked into a monster press of people. Wow! This was not like hiking in Western Washington – one minute on a quiet, peaceful (if paved) trail and the next in a throng of chattering tourists. It was bizarre. I checked my map. From what I could work out, we were at a mid-trail Pavilion near the monkey-viewing area. So much for a quiet hike in the woods. We even took photos of the stuffed monkeys since I figured that with this many people it was very unlikely that we’d see any actual monkeys on this trail. Less that five minutes later I was proved wrong as a monkey brazenly jumped onto a tourist crossing one of the wooden bridges. The guy was very calm – given he literally had a monkey on his back – but our kids were appalled. What and how to deflect errant monkeys became the next topic of conversation as we finally left the tour-bus hoards behind and really started climbing upwards. From here on the trail became much steeper and there were significantly less people on the trail. There was us, a British couple, a group of Dutch girls and about 15-20 young Chinese hikers. We all seemed to be at around the same level of fitness and while still preserving our own little groups, the groups started acknowledging each other at rest stops or as we passed or were passed each other on particularly steep inclines. The Chinese hikers seemed intrigued by our family group and even though language was an issue a two-way conversation was developing. There is a section of the trail which was marked on our map as “99 Bends” which was particularly hideous. We rested with the friendliest group of Chinese hikers and cheered or groaned together along this section. We decided to stop for the day a little earlier than originally planned. I’d be lying if I didn’t admit that the existance of hot showers at the temple weren’t a very big reason for me to choose to stop. Murph and the boys could probably have gone on further but I didn’t want to take the risk that there wouldn’t be such hot water luxury at the next temple. 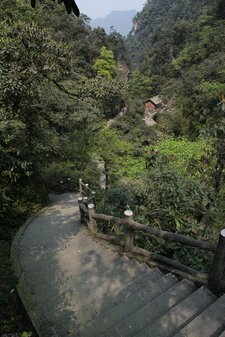 This entry was posted in China, International Escapades and tagged China, China With Kids, Emei Shan, Hiking, Mt Emei on May 17, 2011 by wandermom. enjoyed reading your account of hiking Mt. 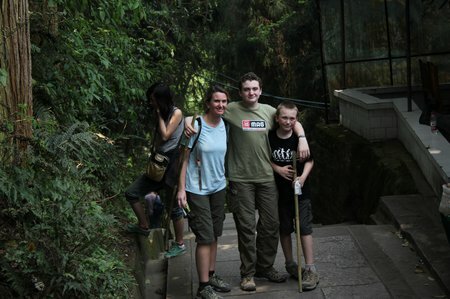 Emei wandermom! we’ll be doing it in a few days and am currently trying to plan our hiking itinerary. it seems difficult to find a map with all of the temples, sites, caves, etc. on it. i’m wondering where you stayed the first and second nights, if you tried for the golden peak sunrise, and if you had any trouble obtaining accommodation when you needed it? many thanks in advance – if you get this in time!